Car Parking solutions that reward you. That’s Ace. Planning and Feasibility Ace Parking can analyse the feasibility of your potential new site, with thorough site research, using our extensive experience to evaluate the local traffic impact and potential parking demands for the area. Parking Equipment Recommendations Assessing the detailed requirements of the car park is imperative to delivering a complete solution that will continue to exceed the requirements now and in the future. Our close relationship with suppliers and our knowledge of the latest innovations in parking equipment and new emerging technologies enables us to implement the most suitable equipment solutions for any car park business. 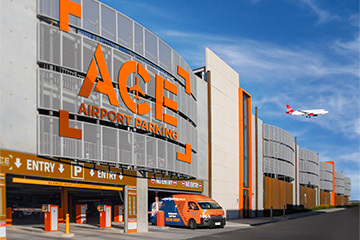 Signage and Way-Finding Strategy Ace Parking can develop the right signage and way-finding solutions for your site, that will safely and efficiently direct vehicles and pedestrians to and from the right level, closest available bay, entry or exit. Providing clear signage with timely and appropriate information is the first step and Ace Parking can assist with a range of implementation options from simple static signage through to an in-depth car park guidance system. Whatever the outcome, by starting with a signage and way-finding strategy across your car parks, you can dramatically enhance the customer experience and improve traffic flow in and out of the car park. Car park design and construction Ace Parking can also assist with car park design and planning, which can have a huge impact on the success of any new development. Engaging with a car park consultant early on in the design phase can have a profound impact on the end outcome. Functionality and operational issues need to be resolved early, so get the right solution from the start and your development can benefit from greater car park efficiencies and increased usability. Parking policy development One size does not fit all and at Ace Parking we can develop site-specific parking policy that suits your particular car park needs, with the flexibility to make future changes as required. Parking patrols consulting Minimise unauthorised parking by incorporating patrol services to your site, including regular vehicle patrols of your car park. Parking Patrols can issue a non-compliance notice to applicable vehicles, which enables the issue of a demand for payment due to breach of contract. The non-compliance notice, demand for payment and appeals process, and any other follow-up correspondence is treated with strict confidentiality.